Schools should be places where the attainment of knowledge and the love for it is nurtured unto no end. Students should be seen as sponges that can soak up all that they hear and see within a classroom. Now, one must not be naive about the difficulty of any teacher’s main objective: helping students reach a certain level of success by meeting some preordained standard(s). Educators have to succeed in today’s classroom, while carrying the weight of having to interacting with students who sometimes have a host of issues outside the school that directly impacts what they accomplish inside the school. Nevertheless, a teacher must be determined to have some idea of what they are getting into before they set foot into any classroom. They should be sure that they are capable of having (and maintaining) self-restraint, even in the midst of having their authority and position undermined and disregarded. The modern-day instructor has to walk a thin line between being knowledgeable of their subject and imparting it to their students and be something of a ‘glorified babysitter’ and counselor when needed. Her gaffe was quite embarrassing as it should be remembered that although our country may have a de facto national language, which is English, there is no official language at the federal level. Also, a student recognized the error in the teacher saying “speak American,” which is nonsensical because it not our actual language. Unfortunately, this kind of statement will make it hard for the educator to gain (or perhaps regain) any trust and respect back from her students. She will have to humbly figure out a way to extend an olive branch to the young people and hope to rebuild a relationship with them. Apparently, she was not at a school assembly, which may further keep any bonding at a standstill, at least, for the moment. The Roman politician, Marcus Tullius Cicero, was quoted as saying, “The authority of those who teach is often an obstacle to those who want to learn.” Well, the obstacle will have increased for this educator no doubt. She will have quite the hurdles to go through to get these students to learn from her again without any future obstruction. Of course, this will hopefully come after they are done with yesterday’s protest. 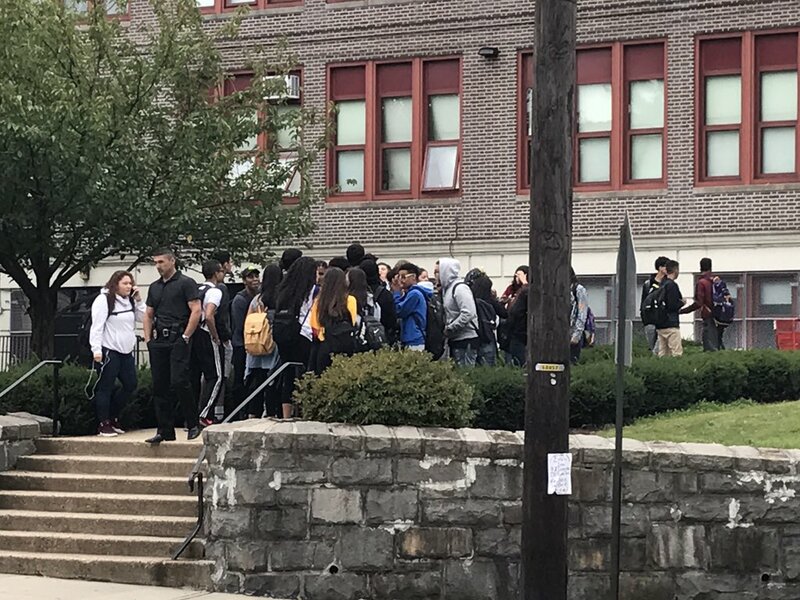 News must have spread quickly of the teacher’s ill-conceived words because, during the school’s fourth period, students walked out of classes in support of their fellow students. Alas, some decided to wave flags that represented other countries, such as the Dominican Republic and Brazil. This form of protest reveals a continued problem for some people that they either do not care about waving the American flag (instead of or along with the country of their origin) or have not been educated to its importance to the citizens of this country. Why continue to “represent” another country or where you are from as opposed to where you are now? The small demonstration by the students showed their excitement, but it could not have been truly thought out. A protest can be good to bring attention to your cause, but the cause should be defined. The teacher made a statement that was insensitive and not appropriate, but it could not necessarily be made out to be the feelings of other school faculty. So, was the protest about getting her fired or just expressing that they will not put up with these kinds of statements in the future? Protest is a part of our rights as Americans, however, irresponsible and illogical protest can always lead to bad consequences, even for high school students.